Finally after a long, long winter, fresh local vegetables are starting to be plentiful around these parts. Mostly what we’re seeing is Greens, Greens, and more Greens, though spring roots like radishes and salad turnips are being harvested too. I tried to align what’s available with the recipes I picked from Kitchen Lioness Andrea’s lineup for Cottage Cooking Club this month. The recipes we cook from British chef Hugh Fearnley-Whittingstall’s cookbook, River Cottage Veg celebrate vegetables, sometimes in familiar ways, and often with an unfamiliar twist, which has been fun. I chose two recipes this month. The first was New Potato Salad “Tartare”. I love potato salad, especially ones made in the French style with a vinaigrette. My signature salad is a Dijon potato salad (which I’m shocked to find I’ve never blogged about), but I’m always up for trying a new version. The flavorings in the salad were inspired by tartar sauce, without the mayo. What a refreshing twist! 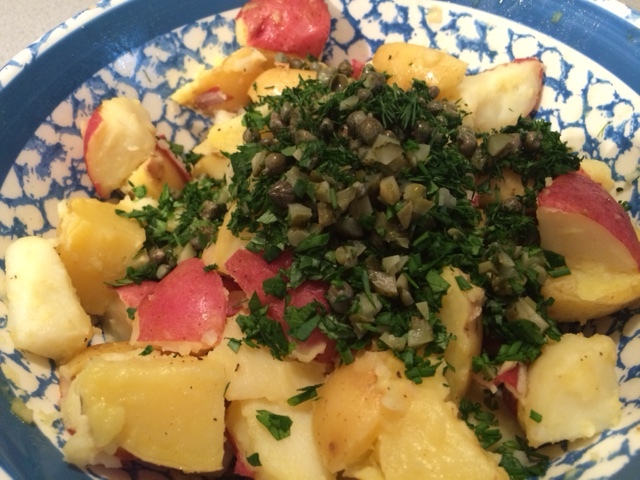 Chopped cornichons, capers, and fresh herbs (dill, chives, and parsley) are added to potatoes along with a simple vinaigrette. Quartered “soft” hard-boiled eggs add the final touch. I was even able to use chives and parsley from my back door herb garden! The only thing I’d change about this is the cooking method for the potatoes. Whenever I boil potatoes for potato salad, I’m unhappy. The potatoes always seem water-logged. I have much better luck with steaming them. I followed the recipe and tried boiling them as directed, but I should learn by now to stick to my preferred method. Other than this hiccup, I loved the end result. The contrast of the salty tangy pickles to the fresh verdant flavor of the herbs make a winning combination. 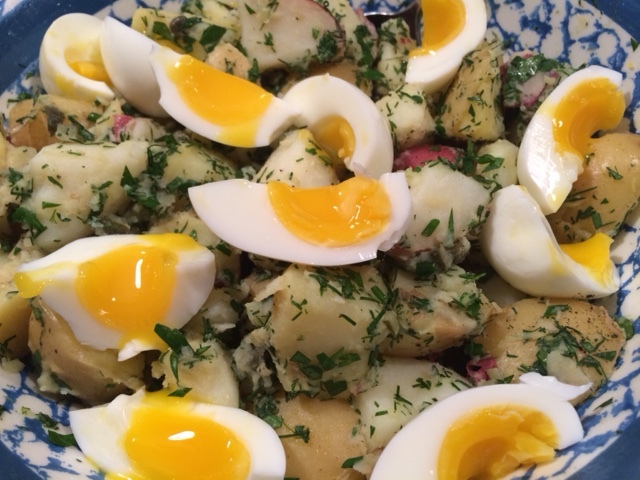 I’ll definitely be making the River Cottage version of potato salad again this summer! 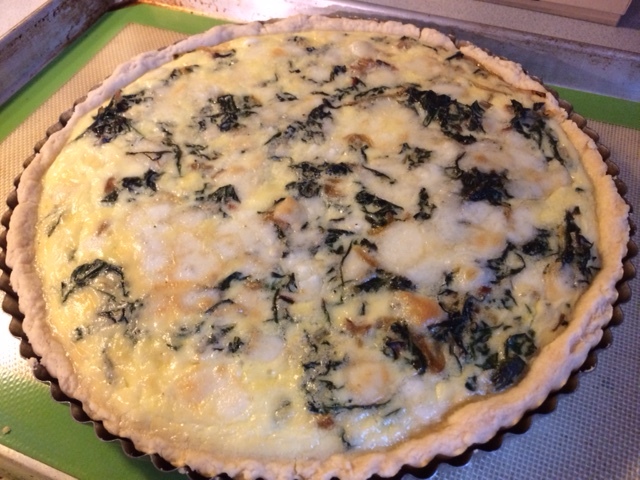 The second recipe was the Greens and Ricotta Tart. I couldn’t find beets with greens the day I went to the farmers market (just a tad too early in the season), but I found beautiful Swiss chard from Kimball’s Farm. I also couldn’t find ricotta salata where I looked, so I substituted another sheep’s milk cheese: Spanish Manchego. Savory tarts are another favorite of mine. In the summer, I make one almost every week. Again, I’m always happy to try a new combination and learn something new. 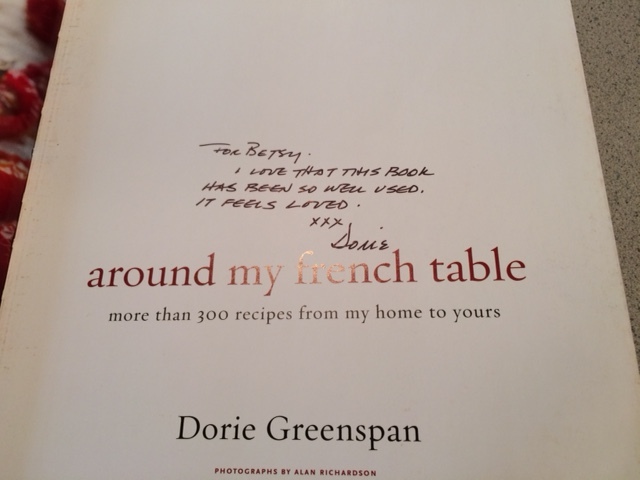 I love when a recipe that uses both the stems and the leaves of greens. It always feels wasteful to discard the stems which they are perfectly edible, though not always in the recipe at hand, and try to do “nose-to-tail” cooking of vegetables when possible. For this tart, thinly sliced stems are sautéed with the onion and garlic before adding the leaves to wilt. The custard for this tart is made richer with egg yolks and cream. The pastry crust was interesting in its use of cold milk instead of water. I found the dough to be easy to work with and the final pastry had a flaky texture. The crust didn’t brown as I would have expected, but I’ll admit I’ve been having some issues with my oven temperature and it was probably that, not the recipe. 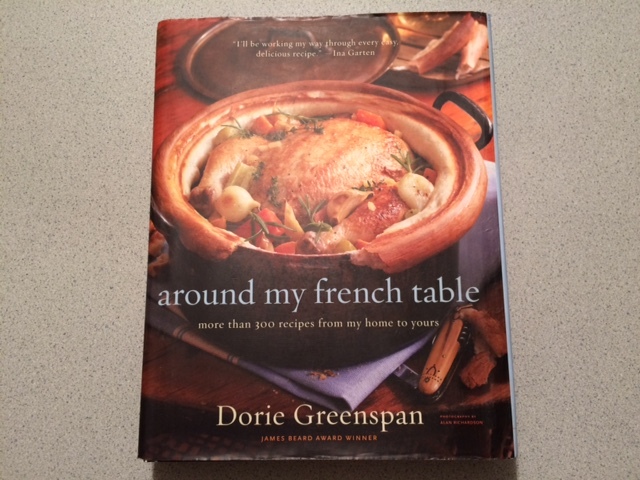 My intuition told me to use a larger tart pan than called for, so I chose an 11-inch instead of a 9-inch. This was the right call. The crust fit into the larger pan with no trouble, and I had custard leftover. I ended up making a mini-crustless tart with some already cooked broccoli rabe and the extra custard. I was very lucky in my choices this month: two winners that I will definitely make again this season. One of my favorite parts of this group is seeing the other participants’ results with the recipes I didn’t choose to make. 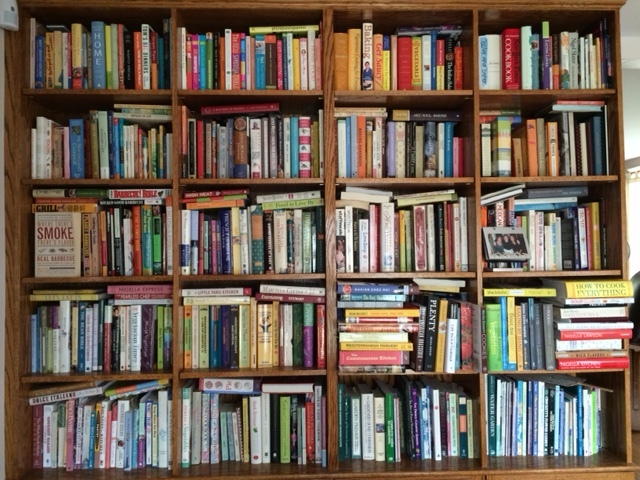 It helps me narrow down the other winners in the book that I must try. If you’d like to see their posts, you can see them here.